Is this guy lucky or unlucky? 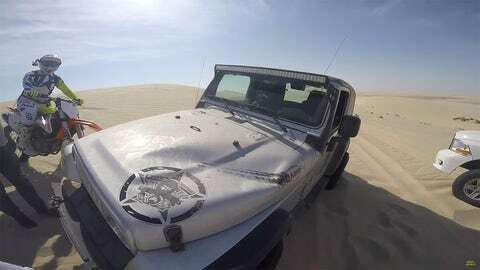 Jumping over a sand dune in the middle of a desert in Qatar and colliding with another vehicle is most definitely unlucky. However, getting away with just clipping the hood and somehow being able to stick the landing is equally as lucky. This incident could have been tragic, and yet could have easily been avoided had the rider’s mates at the top of the dune let him know that there was a convoy on the other side.